Another week, another apartment development. Sometimes they�re good, sometimes they�re bad: sometimes it seems they�re just sent to test the market. There are two more recent apartment buildings being promoted at present: one publicly notified, the other trying to sneak in under the radar. Let�s look at the notified proposal first � as comments are due to the Council by 4 September. This notified consent application is a real test of the developers nerve, and of the Council�s will power. What do you do with a site nestling near the base of the tallest building in the capital? Surely just about anything you do will look relatively small next to the Majestic Tower, so why not try to push your options to the max? The site is next to the St George Hotel on the corner of Willis and Boulcott: at present there’s just a small asphalt carpark area, flanked by the side elevations of the St George Hotel, with an interesting (if unsightly) display of downpipes. A site surely singing out to be redeveloped, if not simply just to help cover up the nasty boxy elevations of the student accommodation behind. Only trouble is, of course, is that it�s in a sensitive position � not so much with the Hotel St George (which it will tower over), but more that just across the road sits the unspoiled, nicely proportioned and rather historic church of St Mary of the Angels. The church, one of Frederick de Jersey Clere�s best creations for the Catholic church, has a truly stunning interior, and fine tracery in the windows, with two tall spires flanking its eastern entry. At one stage in its history, St Mary must have had a commanding presence over the city – now however, it is overshadowed by the Majestic Tower, and is to be joined by another tall presence. The proposed apartments, just across a narrow slip road, are a real stretch into the sky, and are taller than the tallest spire of St Marys by around half as much again. This isn�t going to please some people � there may be some apprehension that the St George Tower Apartments will overshadow the church, or crowd it out by its proximity, and no doubt there will be some objections to the Notified Consent. Designed by Perry Architects for a mystery developer, the building is a strong 18 stories tall, with only two or three apartments per floor. Yes, the site is tiny � but yes, also, the apartments are large, and the development is intriguing. It has gone through extensive wind-tunnel testing it seems, as it has a large perforated metal side elevation, and carefully crafted canopies at ground floor level. The building steps away from the front boundary, and carefully fits the site, making sure to try not to crowd out the views to and from St Mary�s. The facades are mainly glass, with ribbons of Cor Ten steel and perforated steel sheet, yet retain air and light to all side facades, not only to itself but to its neighbours. The building steps again at the height of the top of the towers of St Mary�s: respecting the church (while at the same time gaining a useful outdoor deck for one lucky penthouse owner). The architects have evidently tried very hard to be as deferential as they could, in all aspects except height, and arguably they�ve succeeded. Numerous views have been generated by CAD, which is certainly one thing that Perry Architects are very good at. 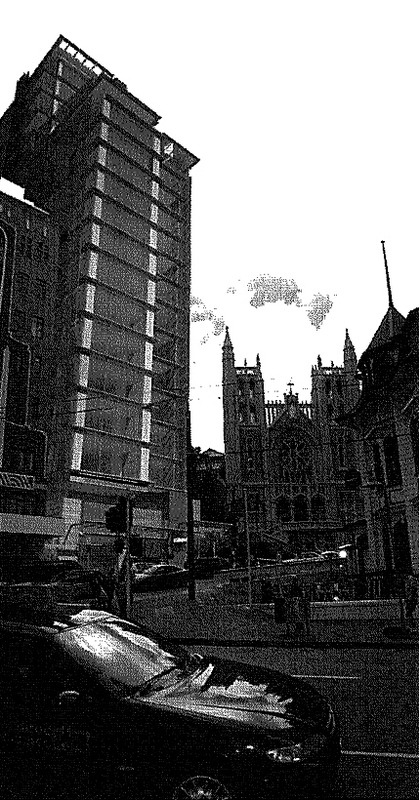 They (and developer Rex Nichols) put up with a fair amount of flack on the Wellingtonian Hotel / apartments scheme, but that project appears to have come off pretty well, and seems to relate well to its surroundings. Certainly these apartments are spaciously sized and aiming firmly at the more up-market end of the spectrum. Overall then, have these apartments succeeded in filling an urban site without destroying the neighbourhood? Yes, its tall � way taller than I would have thought possible, yet it sensibly allows light and air to all sides, and retains the essential views to and from the Angels. While I suspect the market collapse may put paid to this scheme in the immediate future, it shows that a well designed and thoroughly thought out scheme can indeed succeed on a tiny inner city site. Let�s see if the non-notified scheme, coming up next, can do the same. reminds me a little of RMJM’s design for New Zealand House in the Haymarket in London. Which was / is a very beautiful building, in its simplicity of glass walls and horizontal projecting spandrel / fin. Here is a recent photo of the interior of St Mary of the Angels.